My batteries, chassis and house, discharge even if it is plugged into shore power; if I can get the generator started then the coach will start. I have a new batt in the chassis side. Could the house batteries, if shorted plates, draw them all down? This is one of those times where I can only guess at what is causing your electrical woes. Because based on the symptoms you are describing there are several potential causes to the problem. Since you have a new Chassis battery it should not be going dead unless there is a constant drain on it and yes depending on how your 12 volt electrical system is configured there is potential for the House Batteries to affect the chassis batteries. I am going to assume that you have checked and replenished the electrolytes in the house batteries. I am also going to assume that you have also checked the connections to the house batteries and inspected them for any loose or corroded connections. You should also get your house batteries load tested. 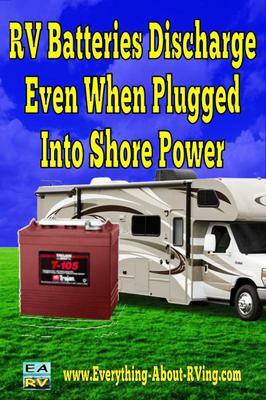 be a problem with the Converter/Charger on your RV not charging the batteries or the batteries themselves not accepting the charge. I am further assuming that you have looked for blown fuses and tripped circuit breakers in your RV. This is just a list of the most common causes of your problem. There could be a short somewhere in the RV, there could be loose connections to the Converter/Charter, etc. If you have checked everything that I have mentioned thus far and the problem still exists then you need to take your RV in and have a Certified RV Technician track down and repair the problem. My camper had an alarm to tell me the batteries were low, that alarm was draining the batteries, we disconnected it and added a solar trickle charger and never had another problem. I had problems with the battery draining on my tow vehicle, a 2001 Suburban. Come to find out, the brake controller was drawing a total of 5 amps. After replacing it with a Prodigy brake controller , the total system draw was 1.3 amps. I just wanted to mention this as a possibility. Good luck with this frustrating challenge.